LIGHTS OUT AND AWAY WE GO with the first ever episode of Pole Position Podcast from Let’s Talk Sport!!! And didn’t we pick a good race to start off with!? 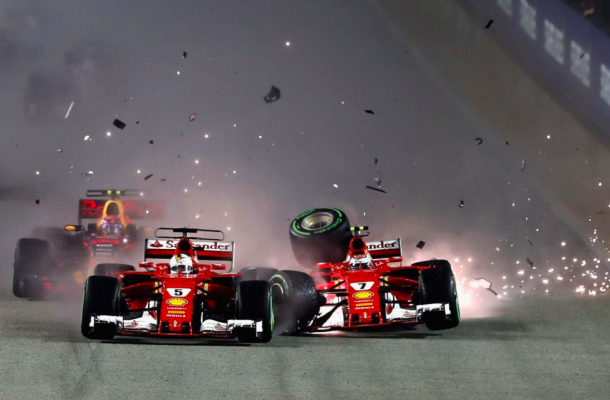 Lewis Hamilton won an emphatic Singapore Grand Prix after championship rival Sebastian Vettel crashed out on the opening lap increasing the lead for Hamilton to 28 points with six races left on the calendar. Is this Hamilton’s championship to lose? What next for Vettel and Ferrari? Host Jamie Davies is joined by his fellow motor heads of Dan ‘Brawn are the equivalent of Leicester City FC’ Middleton, Harry ‘Mr F1’ Wright and Jack ‘Button lover’ Price for all the lowdown including a potential ‘Team Radio Message of the Year’. This new Formula One podcast will be previewing, reviewing, discussing and other activities on the very latest going ons in the fastest sport in the world! Be sure to follow us on Soundcloud to not miss any future episodes of the Pole Position Podcast. Enjoy the podcast… now VAMOS!